You are here: Home / Blog / Vacation Rentals / Traveling this Summer With your Family and Fur Babies? Summer is upon us and it is time to start planning for a fun vacation with your family. It is so important to get away, change up the routine, and recharge! A very big problem for many travelers is leaving their pets behind. Kennels are never an appealing option and even though there are now services where you can watch your fur baby via webcam while you’re away it would obviously be preferred to take them with you. It is difficult to find pet friendly hotels and even more difficult to find a pet friendly hotel with a room that has the space needed for your pet and family to be fully comfortable. As a pet parent vacations shouldn’t be stressful or unattainable. Both you and your furry loved one can be happy travel companions with a beach vacation rental to look forward to. Beach vacation rentals are becoming the preferred place to stay on vacation! 1 out of 4 (24%) family travelers have stayed in a vacation home or condominium rental as an alternative to conventional hotel/resort lodging on a vacation last year. According to TripAdvisor, some of the most popular summer destinations include Orlando, Florida, Myrtle Beach, South Carolina and Ocean City, Maryland (all in the top 5). These are all desired locations because of the weather and their popular beaches! Beach vacation rentals allow you and your family the convenience of stepping outside onto the beach of your choosing. 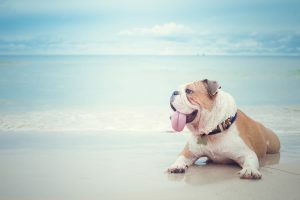 There are so many beachfront vacation rentals that are pet friendly and a simple internet search will show you the many options that are available to you. Imagine enjoying a day on the beach with your family and your very happy dog! It would be a very different feeling watching him/her on your phone via webcam waiting for you at the kennel. Not only that, there are beautiful beach houses for rent. What’s the biggest advantage to a home rental vs. a hotel room? You are staying in a real home and have all the conveniences that come with that. Research from TripAdvisor reveals that 50% of travelers choose a vacation rental over a hotel when they travel because of better amenities. The most popular amenities that travelers are looking for are: a kitchen, stunning views, a private pool, Wi-Fi and pet-friendly properties, according to a recent study. There is also a lot of space for your family and fur baby(babies) so you’re not all cooped up in a small, cramped hotel room. The privacy of a vacation home is optimal as well over a bustling hotel. Everyone at one point has experienced the noisy hotel guests that keep you up throughout the night or wake you before your alarm does the next morning. Whether you are hoping that your vacation will provide relaxation, adventure, or something that keeps everyone in your family happy, beach vacation rentals can provide all of those things! Find a beach home rental company online that has lots of positive reviews, provides pet-friendly options, and has an agent that is willing to work with you on making your vacation dreams come true. Don’t leave your pets behind! Find a vacation the whole family can enjoy!